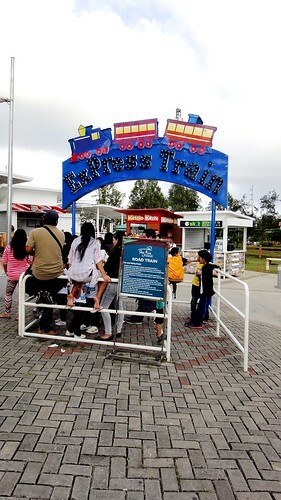 I bet most of you have seen this place along the highway in Tagaytay. 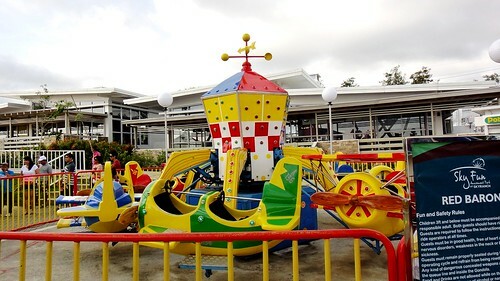 You wouldn't miss this since the first thing you will notice is the giant Ferris wheel that serves as the landmark of Sky Ranch. 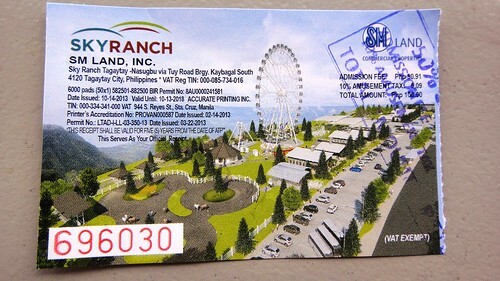 If coming from Tagaytay Rotonda/Cavite, Sky Ranch is on the left side before Vista Hotel. 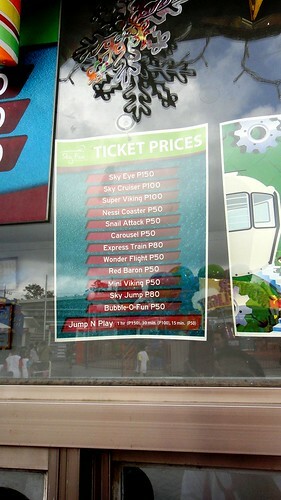 If you're coming from Batangas, it's on your right after Vista Hotel. Hope my directions wouldn't confuse you. I've been seeing a lot of photos from friends in my Facebook who took advantage of the Christmas holiday and weekends to drop by this place. 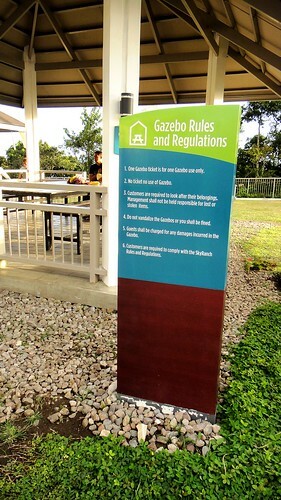 Yesterday I was wishfully thinking that I was in Tagaytay, enjoying the cold weather and nature. 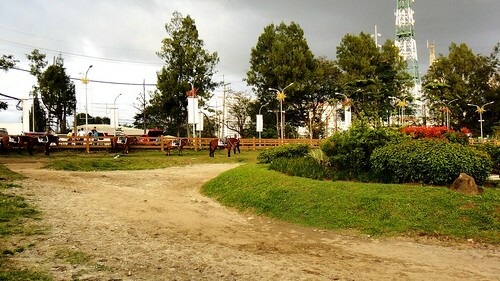 My high school friends and I have a mini-reunion and decided to visit Tagaytay on a Monday, that was last December 16th. 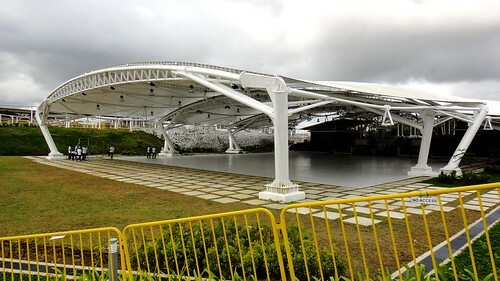 We were hoping that the place is not too crowded since it's a weekday but we were surprised to see a lot of prep students having a field trip. 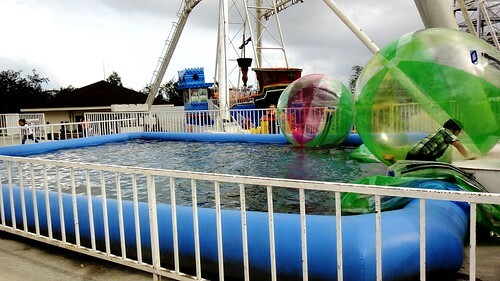 Good thing that we can still move around despite of the crowd. 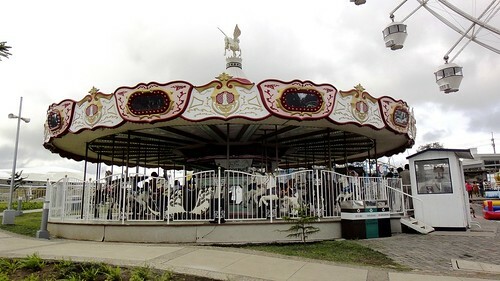 I want to tell you outright that I didn't pay for any rides since the only rides that I'd like are the kiddie rides and it's embarrassing if I'm going to ride alone. 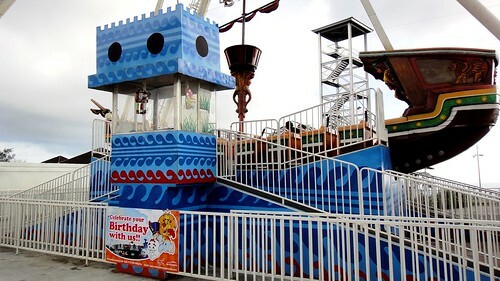 I'm not the adventurous type of person so I dismissed the idea of checking out Sky Eye (Ferris Wheel) and Super Viking (same as Anchor's Away in Enchanted Kingdom). 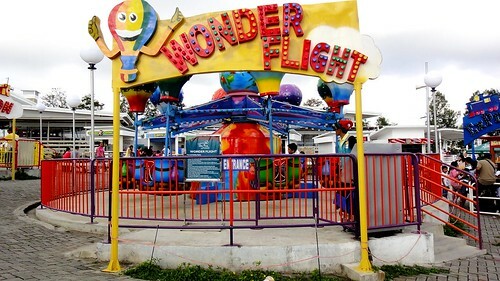 Personally, I'd like Enchanted Kingdom's version of the Wonder Flight. 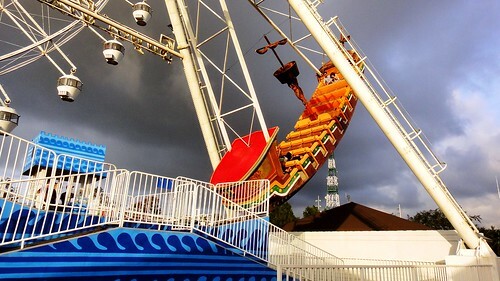 But looks can be deceiving... Now the ship is swinging away! 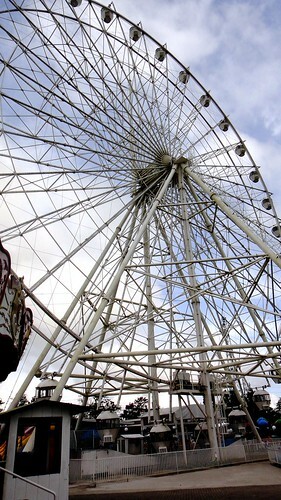 Now I bet you'll say that it's just another theme park with the same old rides. 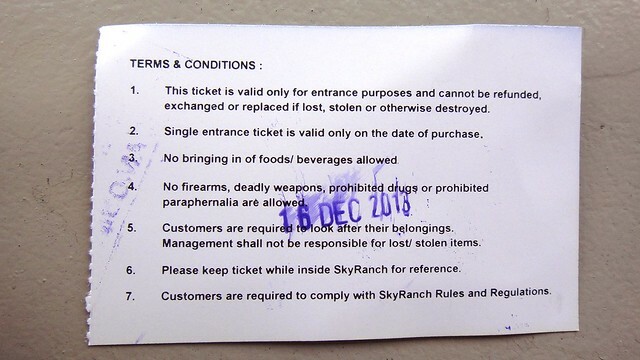 Sky Ranch also offers activities to get your blood pumping. 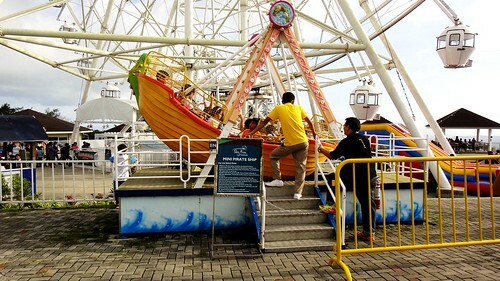 After you've tried all the rides and activities, I bet you will end up hungry. 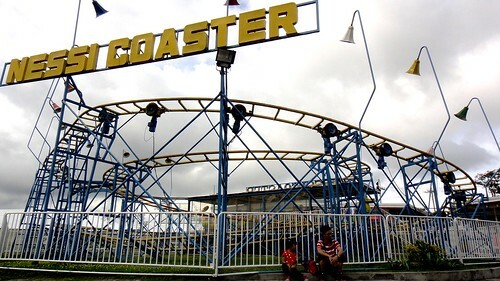 No worries, restaurant/foodchains are lined up on the side of the Nessi Coaster to fill up your complaining tummies. 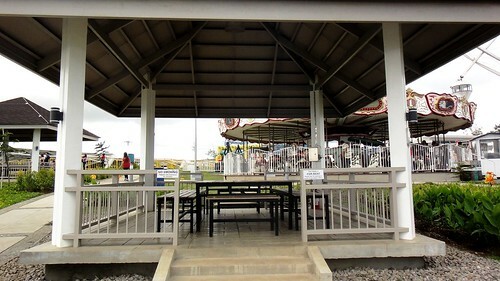 Should you want to relax and simple enjoy the view, the place have gazebos that you can rent. The theme park has an admin office, clinic (which is a good thing should there be any accidents) and restrooms (male and female). 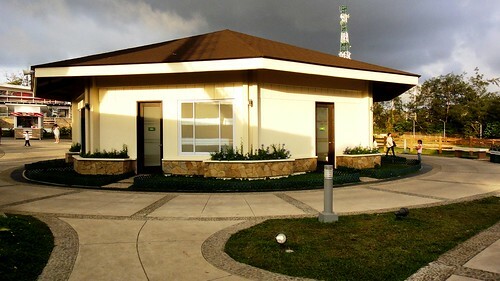 The Venue is spacious which is perfect for concerts, birthday parties and wedding receptions! 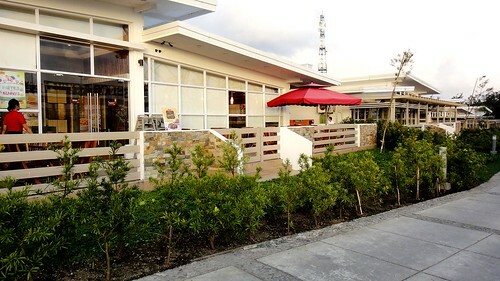 Yes, The Venue is open to cater and celebrate any memorable events in your life. 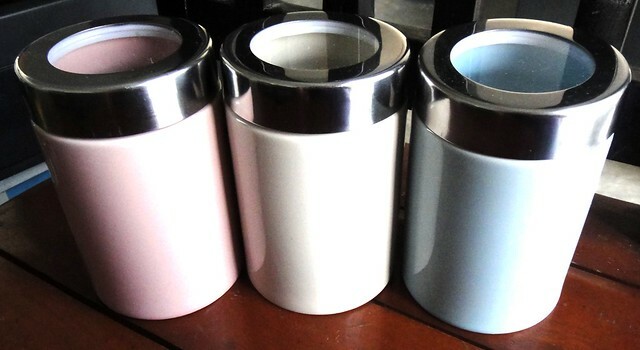 I have no idea on how much it will cost but you can inquire with them directly. 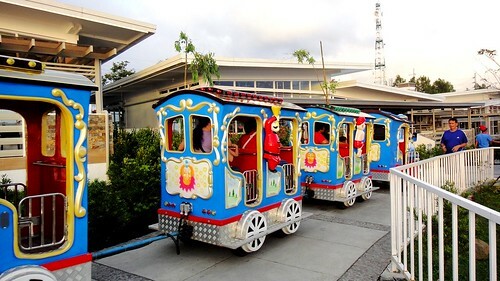 Whether you want to experience all the rides in Sky Ranch or simply have a bonding moment with your family, friends and relatives, it's not so hard to fall in love with Tagaytay with this picturesque scenery. You would wish that you wake up every morning with this view on your window. It's obvious that this post is late since the Feast of Three Kings is over (that marks the end of Christmas celebration in the Philippines) but I thought that this particular gift idea is versatile. You can just give it anytime whether there's a celebration or simply you want to give it as a token to a friend or a relative. What's more this is a healthy and wellness gift without costing too much or burning a hole in your pocket. 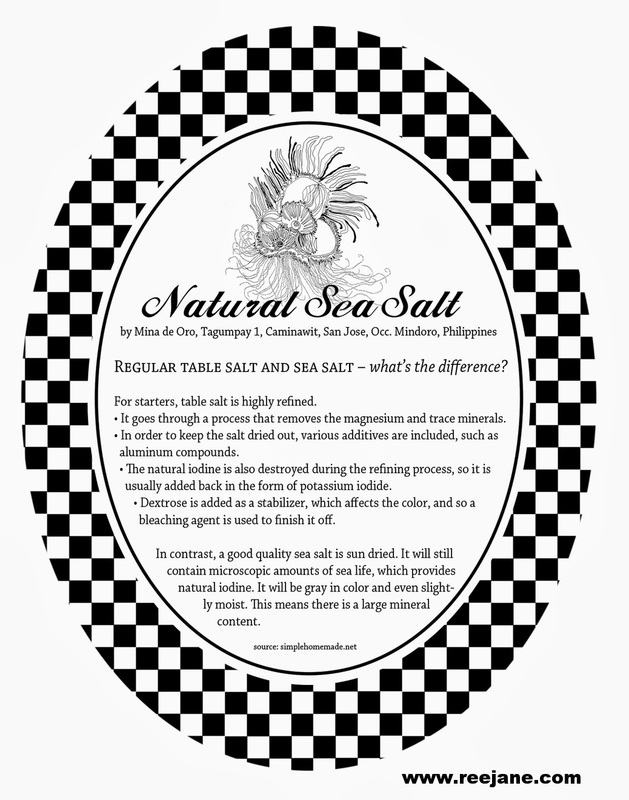 For further reference about sea salt, please check Sea Salt Versus Table Salt and Kosher vs table vs sea salts. 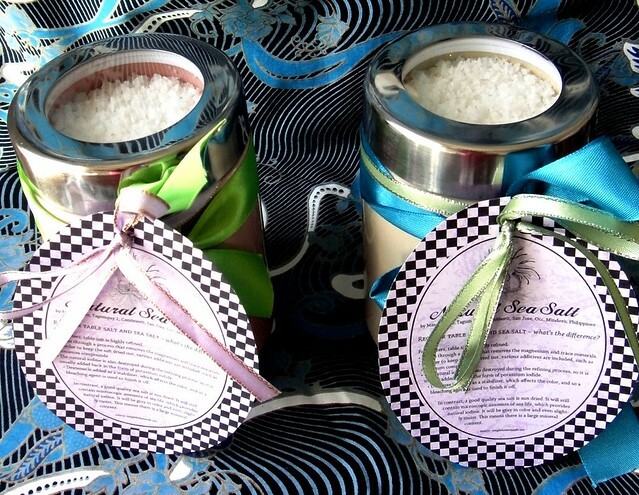 Now that you know that sea salt is a healthier alternative than table salt, all you need is a nice packaging to make it more special. 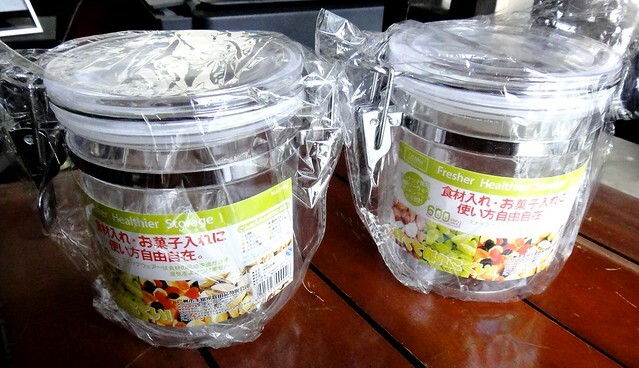 On my case, I've purchased clear jars and ceramic canister from the Japan Stores that offers Php 88/ Php 66 on their items. 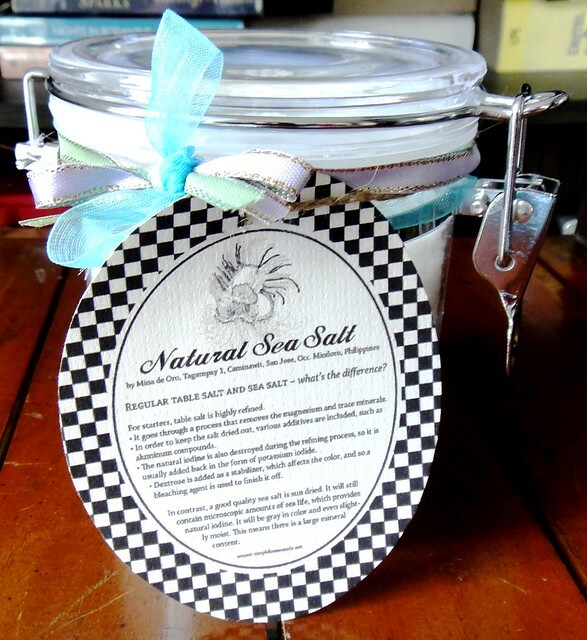 Imagination is your limit on how you will make your simple sea salt to a fabulous gift. Ribbons and laces will not fail you when it comes to adding colors and finishing touches to any DIY craft or project you may have. 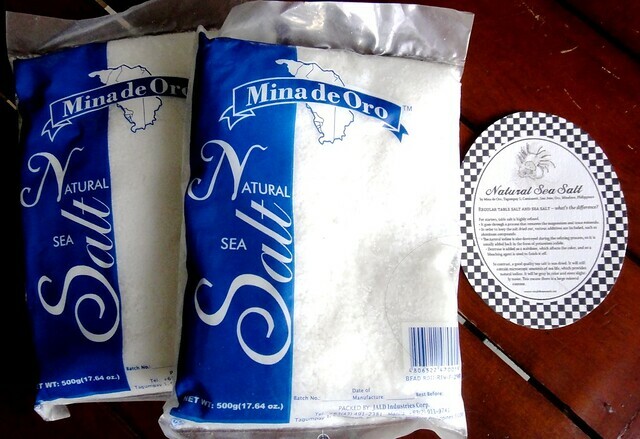 I've been giving sea salt to friends and relatives as a Christmas gift though there are times that I also give them as birthday gifts. As much as possible, I like to give gifts that are useful to the recipient and this one made the list of my affordable yet valuable items. Should you be interested on where I purchase my sea salt, just leave a comment below and I will refer you to my supplier. I've been seeing these past couple of days this particular link which encourages everyone to start saving (mostly in Facebook). The title is "52 Week Money Challenge". 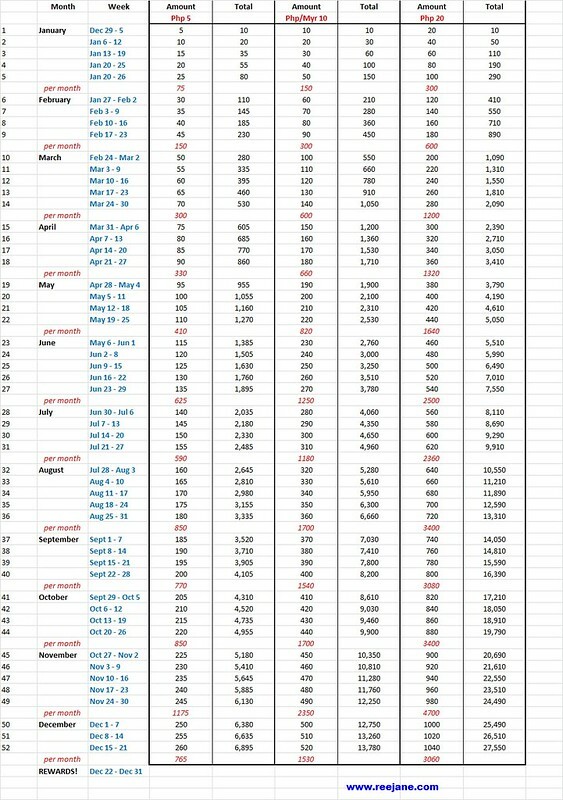 Every week, you will be required to save a specific amount following the table. Example, for the first week of January you have to set aside $5. Then come second week, it's $10 and so on and so forth. As weeks progresses, the amount of money you have to save increases. Not everyone has a positive perspective about this scheme of saving. After all not everyone can save that amount of money especially if you already have a fix budget every month for expenses (utilities, mortgage, insurance, etc.). Take time to read Frugal Find's opinion about this money challenge. 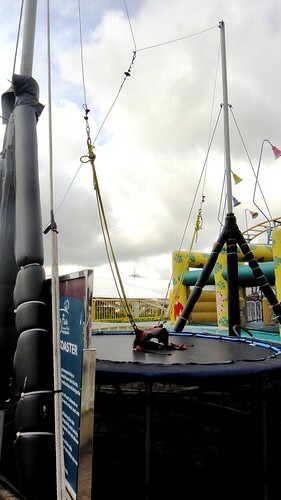 But then again, it doesn't hurt to give this a try. What's more you can tailor fit the amount that is doable on your part for the sake of saving for this year. I believe in baby steps towards financial education and this can be a great idea to teach your children, brothers/sisters, cousins, etc. the value of saving. Since the original 52 week money challenge is in dollar, there are two websites that I found which is in Philippine Peso version that you might want to check out - http://www.kuripotpinay.com/2014/01/52-week-challenge-version-2-kuripot.html and http://minimumcompliance.wordpress.com/2014/01/03/the-mas-kuripot-52-week-money-challenge-earning-27k-to-137k-on-barya/. It's up to you which increments you want to choose so as long as you think that you can achieve your goal and desire to save. My sister who made the table already started saving while I on the other hand will need to catch up as soon as my salary is release next week. I'm keeping my fingers cross to finish this challenge by the end of this year (even if my husband is pessimistic on my capabilities to save). Game on!